This superbubble in the N44 nebula inside the Large Magellanic Cloud was carved out by exploding stars. 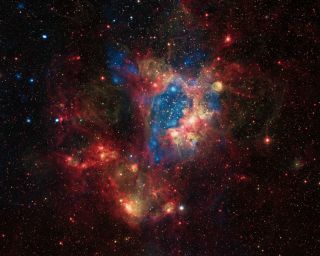 The photo, released in August 2012, comes from the Chandra X-ray Space Telescope, combined with data collected by observatories covering other wavelengths. Exploding stars carve out gas cavities called superbubbles in a nearby dwarf galaxy, as shown in a new photo from the Chandra space telescope. This photo reveals a superbubble in the Large Magellanic Cloud, a small satellite galaxy of our own Milky Way, that lies roughly 160,000 light-years away from Earth. Chandra's X-ray observations are shown here in blue light, which represents hot regions. The red light in the photo is from NASA's Spitzer Space Telescope, which sees infrared light from areas containing dust and cooler gas. Meanwhile, optical light is shown here in yellow in observations from the 2.2-meter Max-Planck-ESO telescope in Chile, which sees ultraviolet radiation from hot, young stars. Combining all these wavelengths, this composite picture helps give astronomers a fuller understanding of this dynamic region. Many of the bright stars belong to the star cluster NGC 1929, which is embedded in the nebula N44, inside the Large Magellanic Cloud. Superbubbles are formed when massive stars reach the ends of their lives, exploding in powerful bursts called supernovas that send out shockwaves through space. These shockwaves and winds push gas outward to carve out huge cavities in space. However, many of the details of how this works remain a mystery. Some superbubbles, including the one in N44, release more X-ray light than current theories suggest they should. This new photo helps astronomers distinguish between the different sources of X-ray emission in this region to try to account for the light they observe.